Victory in Germany for Mitch Evans. © Sam Bloxham/GP2 Series Media Service. 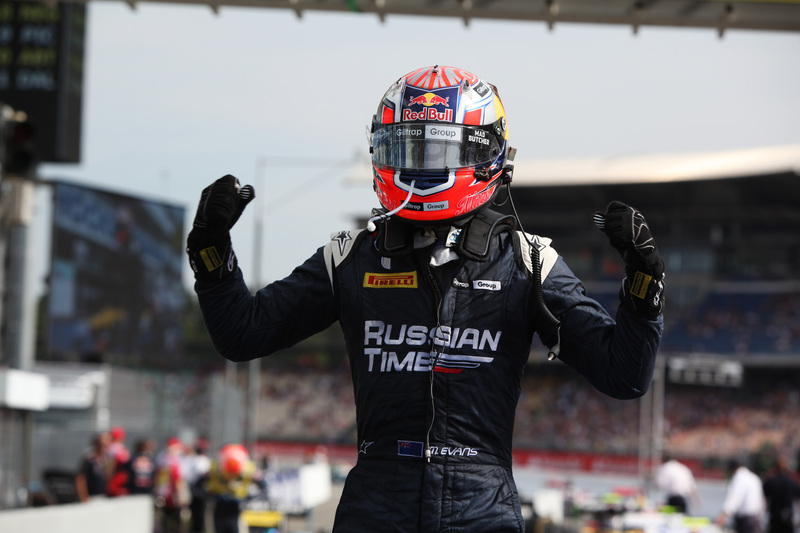 Mitch Evans won the 200th GP2 Series race at the Hockenheimring today thanks to a mixture of clever strategy and stellar driving by the RUSSIAN TIME racer. The 2012 GP3 Series champion kept a stifled Stoffel Vandoorne and Jolyon Palmer at bay through the final few laps, to take the race by just 0.414s after 38 tours. Under the intense heat, tyre degradation was originally thought to be the deciding factor; however while the drop off was less than expected, the soaring temperatures did alter the on track approach considerably. Starting 15th on the soft Pirelli tyres, Evans escaped a first lap scare when he collided with Alexander Rossi; however the Kiwi emerged undamaged. Rossi was less fortunate. From there, Evans maintained a steady pace, before pitting on lap 13, dropping the New Zealand pilot just behind the recently stopped Stéphane Richelmi, whom was dispatched within three laps. Now just over thirty seconds adrift of the lead, Evans began to cut small clumps of time out of the leaders; only lose tenths here and there when traffic came into play; however the RUSSIAN TIME threat remained. As Vandoorne controlled the front with a series of laps in the 1’28” bracket, Evans launched into the 1’27s on harder Pirelli’s, yet the once the edge peeled away Evans began lapping approximately one second slower, while Vandoorne began to dip into the 1’29s. It was enough. As Vandoorne returned to the track after stopping on lap 25, the Belgian dropped in behind Evans, but unusually held back. With a faulty radio and under the belief that Evans had still to pit, Vandoorne held steady until the later laps, before realising that the RUSSIAN TIME man had already made his compulsory tyre change. For Vandoorne, it was too late. With the best of his tyres gone, the ART Grand Prix could little to force an error from the leader, even though Evans was beginning to struggle with his rears. Vandoorne made one final attempt on lap 38, but Evans held his nerve and his lead to take his 2nd win of the season. Make no mistake – this was a brilliantly gauged victory for the RUSSIAN TIME team. Having discovered a problem with the front anti-roll bar after qualifying, the team realigned and pushed into the race using information from Silverstone. It worked and Evans’ intelligent drive thereafter did the rest. Palmer dropped two seconds behind Vandoorne in the last couple of tours, but the championship leader was well ahead of 4th place driver Stefano Coletti come the end. Coletti, however, only narrowly pipped Felipe Nasr at the flag, after the pair had an astonishing battle with Simon Trummer, Johnny Cecotto Jr and Adrian Quaife-Hobbs. After running 4th for much of the race, Nasr stopped on lap 24 – one after Coletti – however having dropped three seconds behind the Monegasque driver in the first portion of the race, there was little Nasr could do to overhaul his rival, despite Coletti setting an astonishing slow in-lap. It’s another points finish for Nasr, but also more points lost to Palmer in the standings. Amidst the quick Coletti / Nasr fight, the early stopping Quaife-Hobbs proved a blockage late in the race, while Trummer and Cecotto Jr stumbled over each other as each tried to break the Englishman. 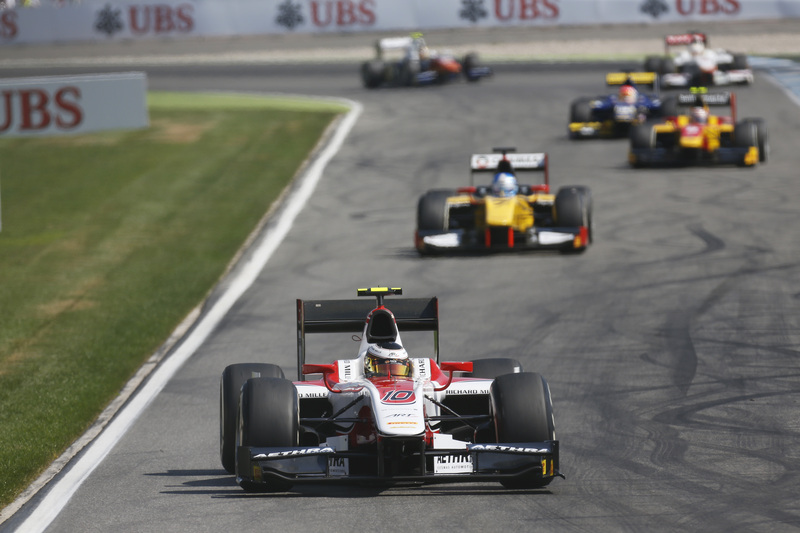 Trummer followed through into 6th place – setting his fastest lap on the last one –while Cecotto Jr’s pace fell away. Nathanaël Berthon persevered to take 8th after stopping on lap 13 – a brilliant drive to the points and reverse grid pole for Race Two. Marco Sørensen finished 9th after climbing up from the penultimate row of the grid and Stéphane Richelmi closed out the top ten, scoring the final point for DAMS. The race was briefly interrupted after the start by the safety car. Following collisions between Sergio Canamasas and Conor Daly, Artem Markelov and Jon Lancaster and the Evans / Rossi incident, the area from the exit of turn two, through the Parabolika and the Hairpin became littered with debris. With punctures a very real possibility, the race was neutralised for three laps until the carbon fibre remnants were cleared. Daly was also hit with a drive through penalty for pit lane speeding, when his speed sensor failed for the fifth time this season. Vandoorne led Palmer for much of the race. © Sam Bloxham/GP2 Series Media Service.